In a small bowl, combine ingredients for stuffing until well incorporated. Using a chef’s knife, carefully butterfly the chicken breast just enough so that a large pocket forms. Do not cut the chicken breast in half. Stuff each chicken breast with half of the spinach mixture and then press the top part of the chicken down firmly. Season the chicken breasts with 1 tsp salt and 10 turns of fresh cracked pepper. 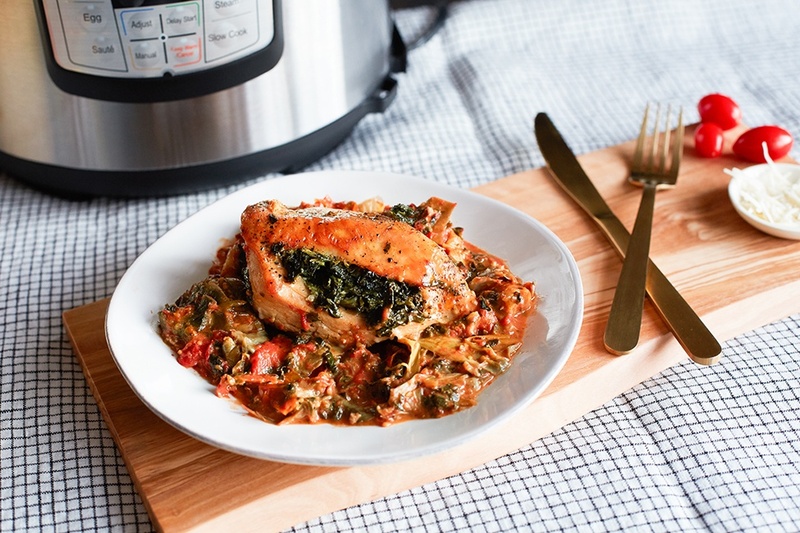 Set the Instant Pot™ to the “saute” setting - high - no delay - keep warm OFF. Hit the START button. Once the preheating step is complete and the screen reads HOT, add 1 T olive oil and then both chicken breasts. Allow chicken breasts to sear for 2 minutes, carefully flip, and then sear the other side for 2 more minutes. DO NOT use lid at this time. Add broth, tomatoes, and artichokes. Secure the lid on the Instant Pot™, set to “pressure cook” setting - high - 3 minutes - keep warm OFF. Hit the START button. Once timer goes off, hit CANCEL, quick release the pressure, and remove the lid. Switch to “saute” setting - high - 7 minutes - no delay - keep warm OFF. Hit the START button. Once timer goes off, hit CANCEL. Add cream, Romano cheese, ½ tsp salt, and stir. Spoon sauce over each chicken breast and then finish with a squeeze of lemon juice. © Ocean Mist. All Rights Reserved.